Top, top shelf talent still remains at the 2011 WSOP Main Event. 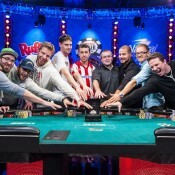 NOTE: Get full WSOP Main Event recaps here. 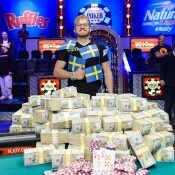 The 2011 WSOP Main Event burst the money bubble on Friday. And like the move Fast and Furious, action was fast and furiousTM once number 693 (John George) hit the cashier’s cage. By the end of play, only 378 remained. Just missing the money bubble was Phil Hellmuth, who was KO’d about 25 before hitting pay dirt. Cashing but exiting before the end of play were the likes of Jake Cody ($19,359), Shannon Shorr ($19,359), two-time Main Event champ Dennis Phillips ($21,295), and Sandra Naujoks, a woman ($30,974). Leading all players going into Day 5 is Manoj Viswanathan (from Brooklyn, seriously) with 2,115,000. He’s followed by WSOP Circuit champ Sam Barnhart with 1,925,000. Some notable bigs remaining include (non-offical but close chip counts): Ben Lamb (1,268,000), Jean-Robert Bellande (1,134,000), female big stack Amanda Musumeci, a woman (1,064,000), pink0-haired Guillaume Darcourt (1,052,000), Daniel Negreanu (619,000), Allen Cunningham (592,000), Erick Lindgren (492,000), and Todd Brunson (380,000). Get a full Day 4 recap here. 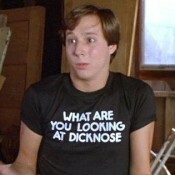 Dennis Phillips? A 2 time main event champ? I don’t think so.